Galicia (Spain) Official regional language. Decades of development as language of literature, including poetry and essays for all levels of education. Growing sense of ethnic identity. 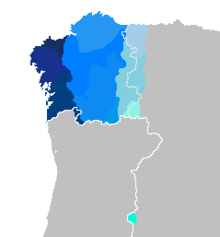 Distribution of the various dialects of Galician in Spain and the extreme north of Portugal. Galician (Galician: Galego, Galego-Português) is a language that is spoken in Galicia, just north of Portugal. It is very similar to Portuguese. Some even say it is the same language but with a different accent. Galician is very close to Leonese language. Galician is a Romance language that started on the west part of the Roman Empire called Gallaecia. Today, this same place is the north of Portugal and Galicia itself. Galician took words from many languages, like Latin, Germanic, Spanish, and Celtic. The Galician of today comes from the Galician-Portuguese language spoken during the Middle Ages. Today, Galician is spoken only in Galicia and by some people in North America, South America and Western Europe. In Jalisco, Mexico used to be Nueva Galicia and still carrying Galician accent and words in Jalisco. Some people say Galician and Portuguese are the same language, because there are not a lot differences between them, but they are officially two separate languages. People that speak Portuguese and people who speak Galician can understand each other very well. ↑ "Observatorio da Lingua Galega". Observatorio da Lingua Galega. Retrieved 17 October 2015. ↑ "Ethnologue report for language code: glg". Archive.ethnologue.com. Retrieved 17 October 2015. ↑ Hammarström, Harald; Forkel, Robert; Haspelmath, Martin, eds. (2017). "Galician". Glottolog 3.0. Jena, Germany: Max Planck Institute for the Science of Human History. This page was last changed on 17 August 2018, at 18:15.